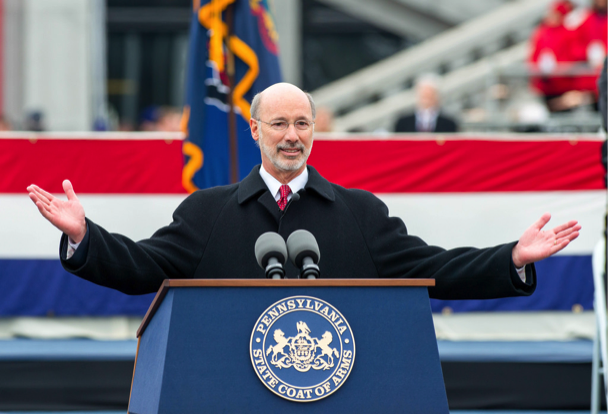 Tom Wolf speaks to a crowd during his inauguration as the 47th governor of Pennsylvania. At the beginning of January, Governor Wolf of Pennsylvania signed an executive order putting in place both the first statewide air pollution and carbon pollution targets with measurable checkpoints. Wolf is now starting his second term, and has been working since 2015 to lessen Pennsylvania’s impact on the environment. This month he created an additional GreenGov Council to coordinate, achieve and develop more sustainable practices, like increasing building efficiency across the state. Wolf also aims to decrease greenhouse gas outputs statewide 80% by 2050 from 2005 levels and has tangible goals for transitioning the state vehicle fleet to electric, moving to renewables, and minimizing overall energy consumption. Wolf has taken action against climate change thus far by identifying a goal of 10% of electricity production be from in-state solar resources in the next decade, setting limits on methane emissions focusing on gas wells, and using $118 million from the Volkswagen Settlement to mitigate air pollution from transit. He is also taking great steps to reduce water pollution across Pennsylvania as well as restore old mines for environmental and economic purposes.